Attributed to Confucius - "Do not use a cannon to kill a mosquito"
While its debatable whether Confucius ever said that or not, the fact is mosquitos are not only annoying and their sting/bite hurts, they can transmit diseases from animals to humans, humans to animals and human to human. Some of these diseases are quite deadly, including West Nile Virus, Yellow Fever, Eastern equine encephalitis and Western equine encephalitis (EEE and WEE are considered especially deadly). Even though HIV transmission via mosquitos has been proven false by the CDC, the other diseases they transmit are reason enough to try to ensure you never get bitten. While mosquito repellents, especially those with DEET are quite capable of ensuring they don't get close, there are situations where using a mosquito repellent isn't reasonable. This can be because of clothing being worn, the number of people present or simply the lack of desire to smell like mosquito repellent. Fortunately, there are alternatives such as the use of mosquito traps. While commercial traps are available, it is quite easy to make a fairly effective and inexpensive homemade mosquito trap. The ingredients and steps are quite simple and are things you probably have on hand already. 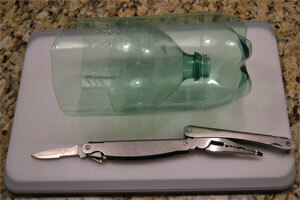 Most often, a 2 liter bottle is used although 1 liter bottles done the same way are effective as well. Black wrapping such as a black trash bag, construction paper, etc. 2.) Combine brown sugar and hot water. Stir to dissolve brown sugar into the water and allow to cool. 4.) Distribute yeast the same way. (half a gram per 1 liter, full gram for 2 liter). There is no need to stir in the yeast. 5.) Invert the top of the bottle and insert into the bottom half, creating a funnel and tape in place, creating a seal around the top. 6.) Cover outside of trap with black material, leaving the top open. Either make new traps or refresh ingredients every two weeks to maintain effectiveness. The combination of the brown sugar and the yeast not only gives off a sugary odor, it also creates a chemical reaction that produces carbon dioxide. Both the sugar and the carbon dioxide attract mosquitos and the black wrapping is also attractive to them. Creating a funnel out of the top of the bottle allows the mosquito in, but prevents them from easily escaping before they either succumb to the carbon dioxide or starvation. By creating a seal at the top of the bottle around the cut with tape, you accomplish 2 things. First, you prevent the carbon dioxide from escaping and you also prevent gaps where mosquitos can escape. The effectiveness of the yeast and brown sugar water is only good for up to 2 weeks so replacing the trap will be necessary. If you do a lot of outdoor grilling or like to sit outside during the evenings, finding some way to keep the mosquitos away is a must. An inexpensive and easy to make mosquito trap like this could very well be your answer!